Since Super Mario Bros. was first released to the gaming world, platformers have remained a constant standby in the realm of video games. This is no surprise, since the core gameplay concept of the genre is easy to grasp, and both challenging and fun to execute. Pigs Can’t Fly, however, is (or tries to be) a twitch platformer like Super Meat Boy or League of Evil, so don’t expect it to be as forgiving as Mario. But is it worth the pain to get to the end? Pigs Can’t Fly opens with our hero, an unnamed pig, on his way up to heaven after being turned into bacon. But before his angelic rise can be complete, he is hit by a passing commercial airliner and sent spiraling downward, ultimately crash landing in hell. Obviously, this is not a place he wants to stay. Now, using only his newly acquired angel wings, he must maneuver his way out of hell, which is constructed surprisingly like a series of micro-levels. The first thing you’ll notice that’s unique about Pigs Can’t Fly is its pacing. It is a twitch platformer in that every obstacle will one-hit-kill you, but the pig maneuvers much slower than other platforming heroes. He can’t jump or run in a traditional sense, and is relegated to just flapping his wings to move around. You can only fly so fast, so speed runs and the like are out of the question, but this is not necessarily a bad thing. Just because the pace is less frantic than other games does not make Pigs Can’t Fly boring. If anything, maneuvering around each obstacle becomes more of a thought-out process than it would if you were able to zip through each level. Though the pacing doesn’t make the game dull, the level design does. Although some good mechanics are in place, each level feels just bland. 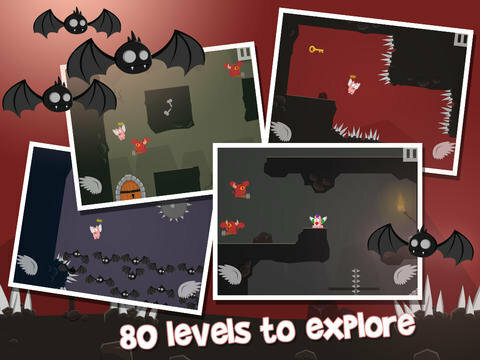 The obstacles lack variety (consisting of spikes and bats, mostly) and as such, the excitement of encountering a new obstacle only comes to the player a few times. Not to mention the game is a short outing, and its small collection of micro-levels can be finished in a few sittings, with not much reason for replaying. It does control and look good though, which makes it all the more of a shame that those assets weren’t better utilized. 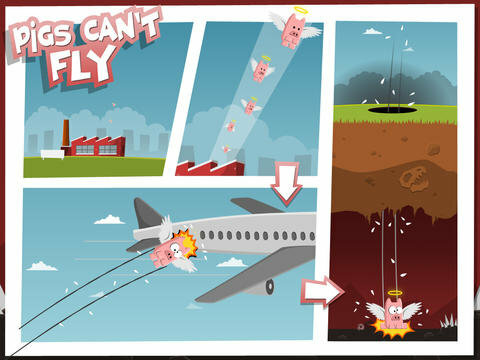 Pigs Can’t Fly is not a bad game, however it is a lacking game. Its content is fairly basic, and its length is short. The basic setup of a good platformer is there, but a lack of fresh level design and a sparse selection of said levels ensures that player apathy will be quick to set in. Better designed levels would go a long way, as would a level-editor of some sort, but for now, there’s not a legitimate reason to buy this app.